Known as “The land of the Gods”, Shimane is a beautiful prefecture formed of both coastal and mountainous landscape. Owing to the area’s deep spiritual history, Shimane’s temples and shrines are plentiful. Matsue, the prefecture’s capital, has one of the few remaining medieval castles in Japan, a number of beautiful art and history museums and the picturesque Shinjiko Lake to explore, whilst the city of Izumi houses both the Taisha Shrine, one of the oldest Shinto shrines in Japan and the idyllic Inasa beach. From Matsue, a ferry can take you to the Oki Islands, a remarkable collection of 16 islands “untouched by time” whilst the city of Hamada houses Aquas, one of Japan’s largest Aquariums and a popular tourist destination. 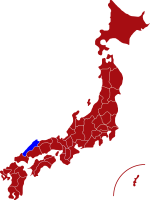 The town of Omori, near the city of Ōda, is home to the Iwami Ginzan, Japan’s largest silver mine. The area was designated as a UNESCO World Heritage Site and is considered a "must-see" attraction for visitors to Shimane. There are many festivals taking place throughout the year to enjoy in Shimane’s cities including an Irish festival held in the capital to celebrate St. Patrick’s Day. For more information about Shimane prefecture, see their official tourism website. Air - The main airport in Shimane is Izumo airport, which is located in the north of the prefecture and about 25 minutes drive from Matsue city centre. 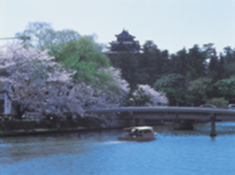 The airport operates daily flights between Tokyo and the journey time is 80 minutes. Click here for its website (Japanese only). Rail - From Tokyo Station take the Shikansen to Okayama and change to the Super Yakumo train. Journey time is around 6 hours. From Osaka via Okayama the journey takes around 3 hours 30 minutes. 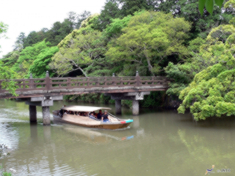 Horikawa Boat Cruises - Matsue is known as the "City of Water" and cruising through the many canals that cross the city and by the castle is the perfect way to enjoy the sights. Matsue Castle was completed in 1611 and is one of only 12 original castles remaining in Japan. From the tower, visitors can enjoy spectacular panoramic views across the city. 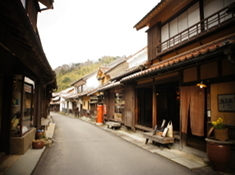 Iwami Ginzan Silver Mine was the largest silver mine in Japan between 1526 and 1923. A tour of the two remaining caves open to the public gives a fascinating insight to how hard it must have been working down the mines. 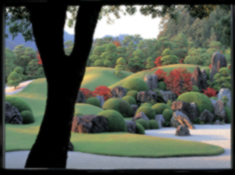 Adachi Gardens is home to the Adachi Museum of Art which houses a wonderful collection of Japanese art including paintings by the celebrated artist Taikan Yokoyama.